In terms of scale, this was a huge project to undertake. The house is a 150-year property with a huge plot of land which circled the property. 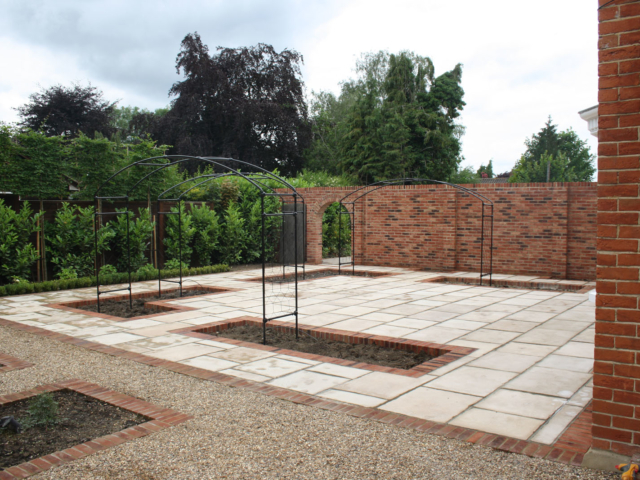 We divided the project into 2 and undertook the works over 2 consecutive Summer’s. 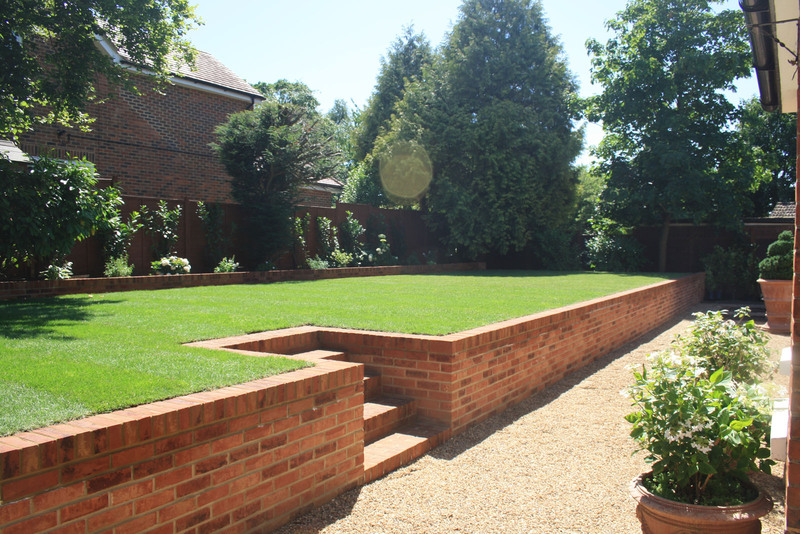 Firstly, we had to install a huge retaining wall for the lawn, which was over 30m in length and a metre high. 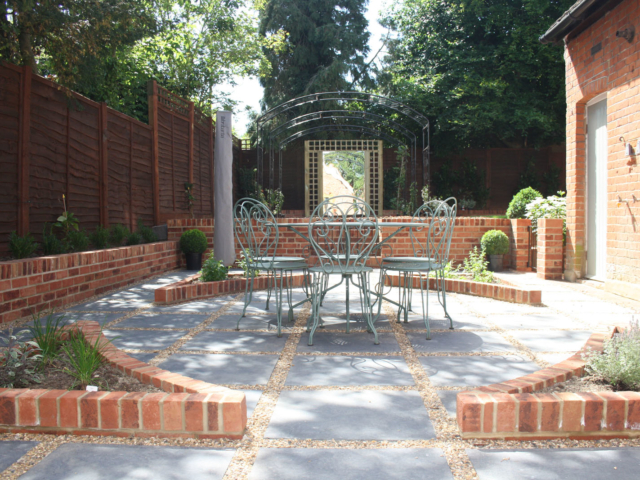 The wall also continued, and we created a terrace with ornamental planting with water feature and, pergola’s and a mirror for a focal point. 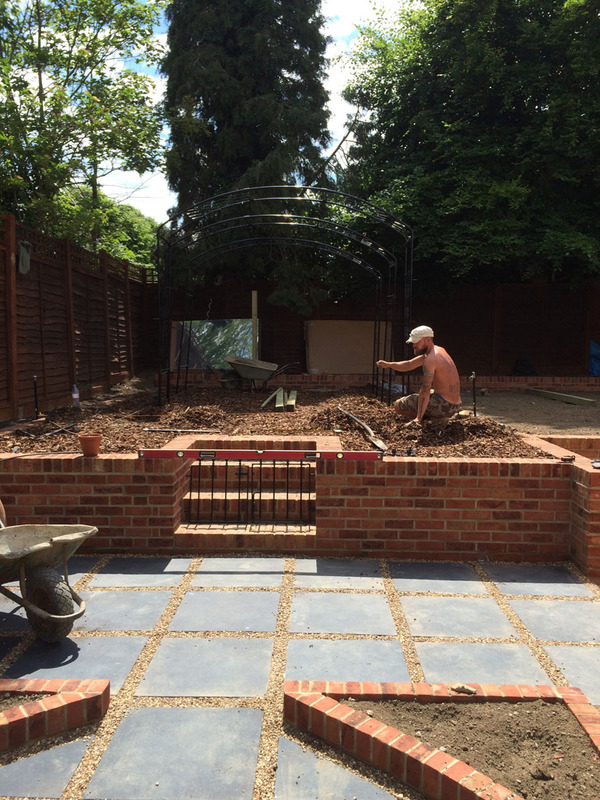 We also constructed a courtyard with raised beds. 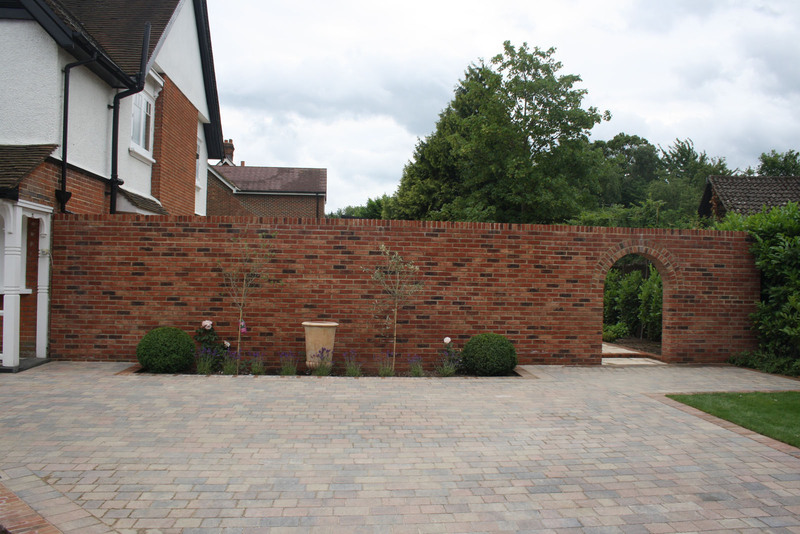 Phase two was the driveway and a huge dividing wall with a featured archway. 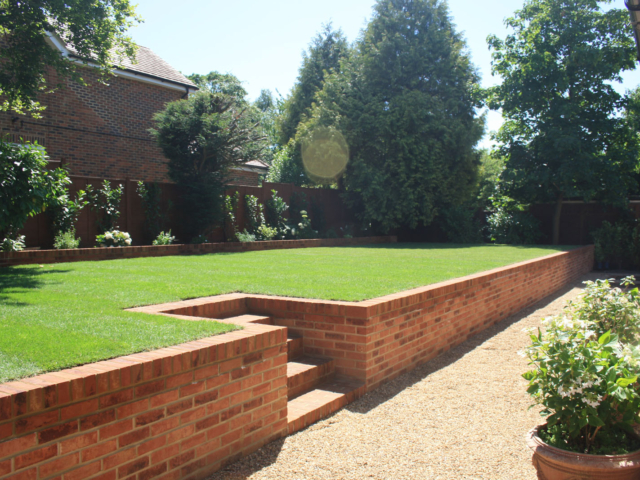 Firstly, we had to install a huge retaining wall for the lawn, which was over 30m in length and a metre high. 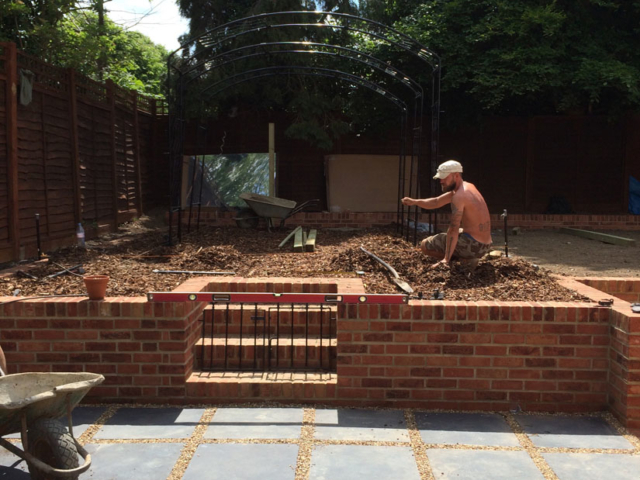 The wall also continued, and we created a terrace with ornamental planting with water feature and, pergola’s and a mirror for a focal point. 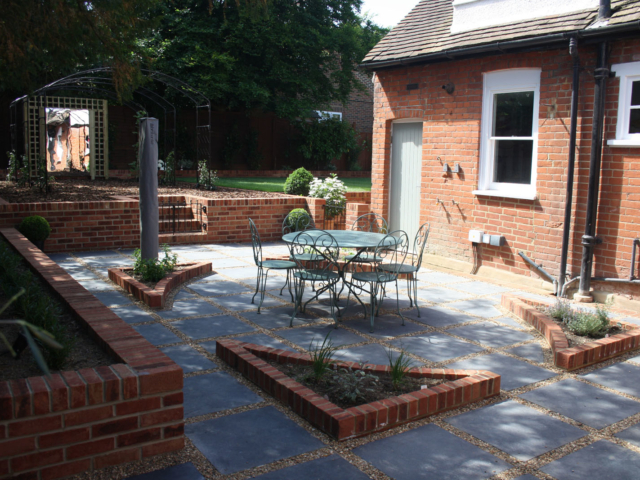 We also constructed a courtyard with raised beds, all from matching bricks to the house with Black Limestone and resin bound channels between to add interest and detailing. 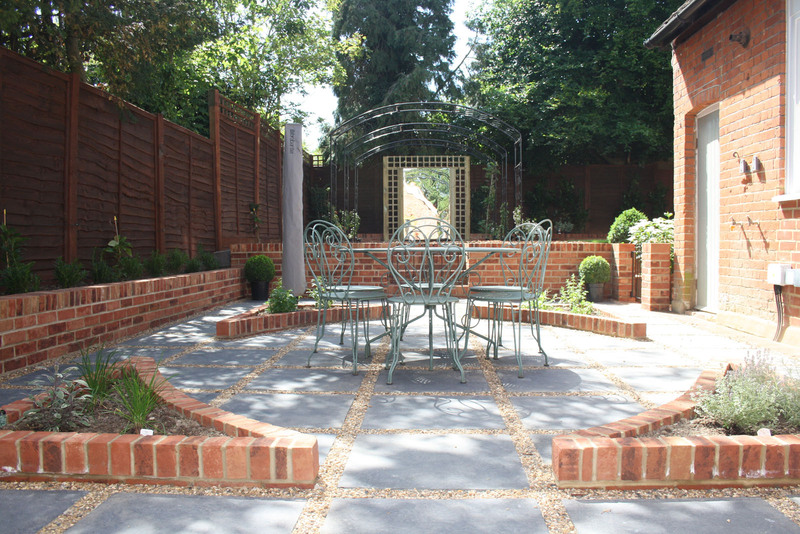 Our client has a property in Spain and the brief was to create a Mediterranean style courtyard garden to match their period property. 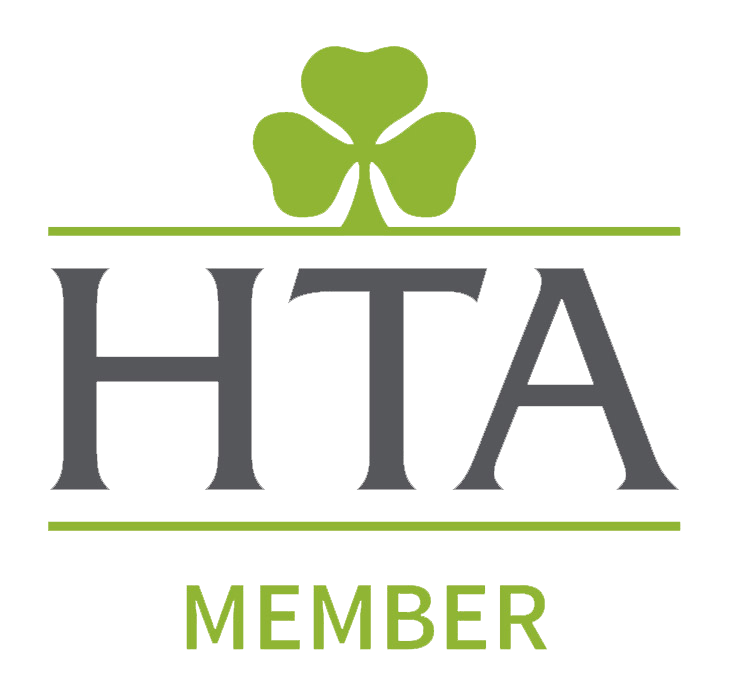 This was achieved, and our client was extremely satisfied with the suggested materials and implementation and detailing of the project. 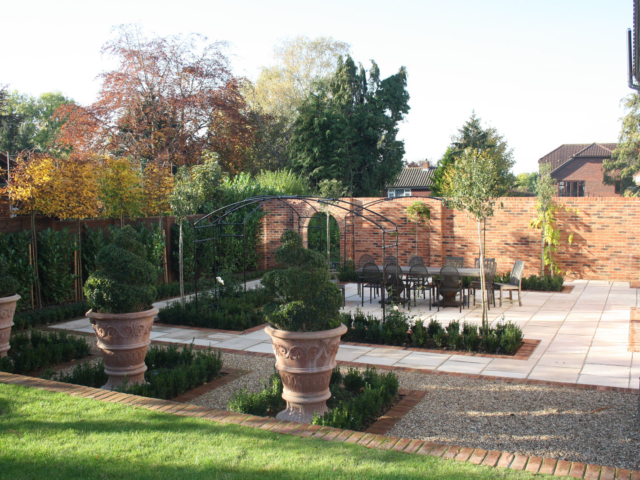 Next, we had a 150m2 area to create another huge terrace, which was to be used as an outdoor dining area, with huge planting areas. 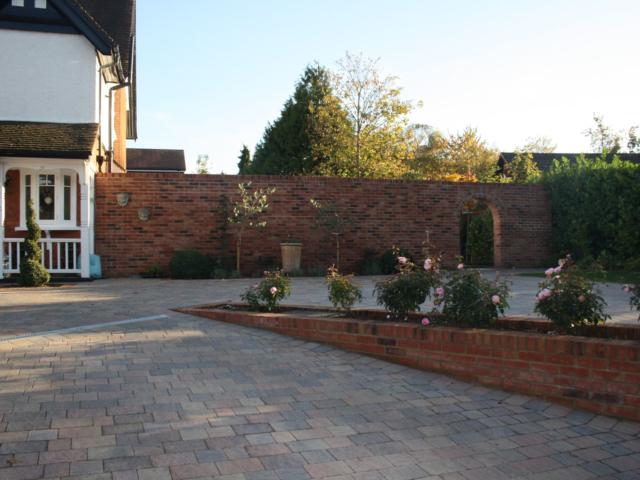 For this area, we used replica York stone pavers, which perfectly complemented the property. 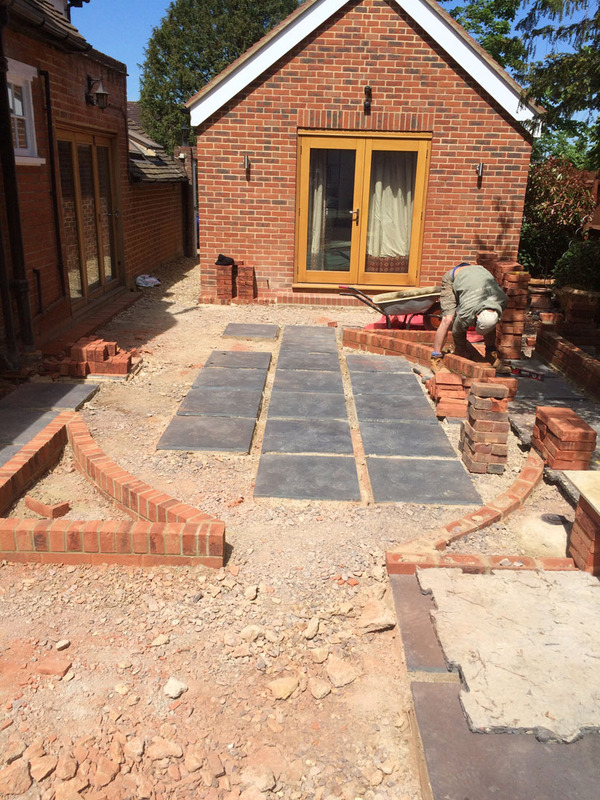 We bordered the patio and all the flower beds with matching soldier course brickwork. 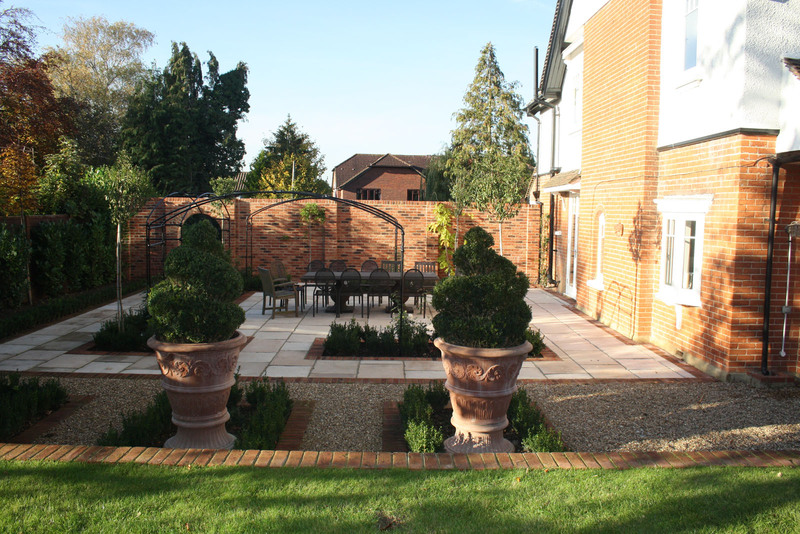 The Mediterranean theme by installing huge terracotta pots and added formal planting and hedging. 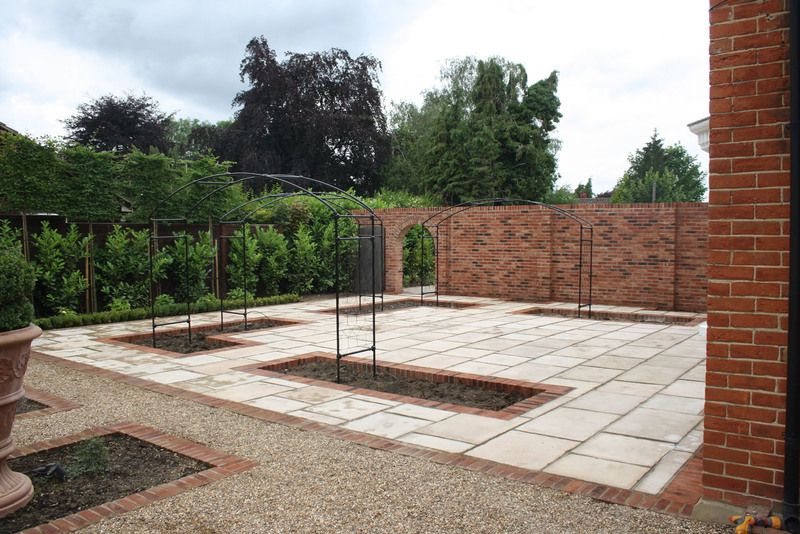 Lastly, we laid a 200m2 lawn and planted the beds to finish phase 1. 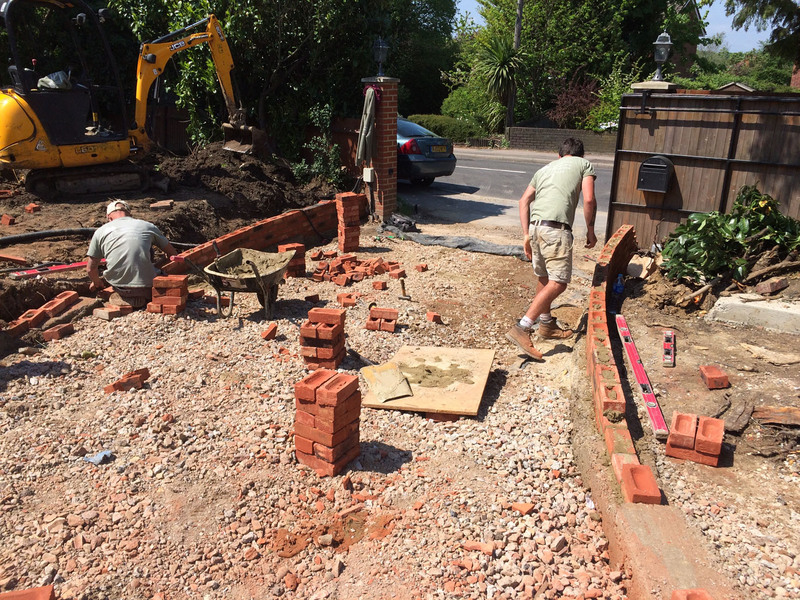 This is always the most satisfying part of the project as the garden suddenly comes to life with the vibrancy of the planting and luscious lawn. 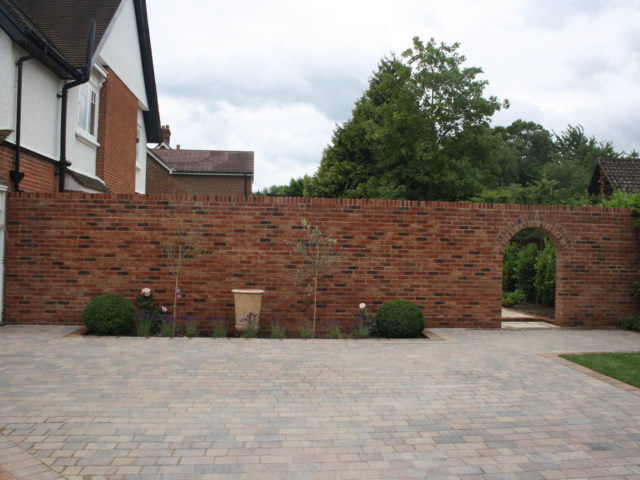 Phase 2 was the driveway and a huge dividing wall with a featured archway. 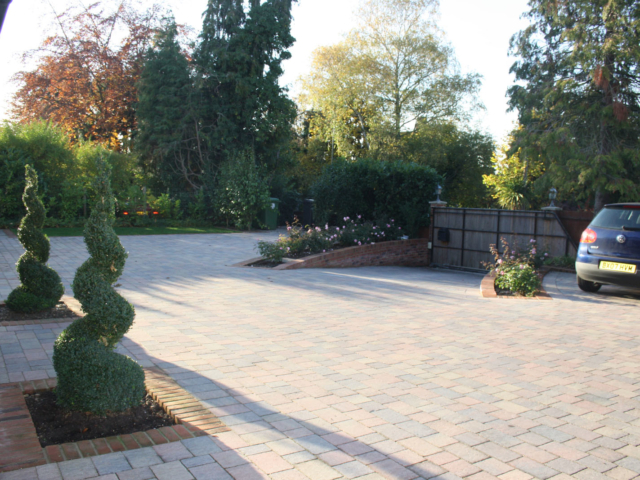 The driveway had been temporarily gravelled after renovation works, but as there was a significant slope from the road to the house, the cars would often struggle over the gravel. 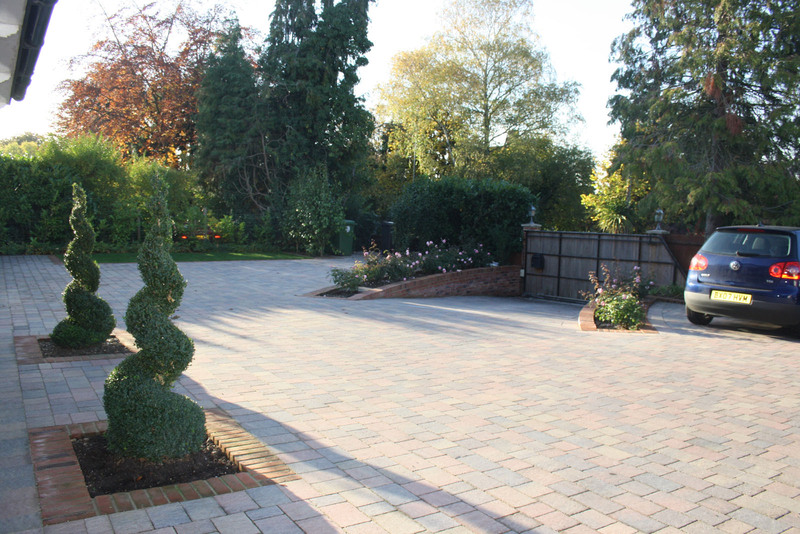 We installed retaining walls for the entrance and then installed a 350m2 driveway using Marshall’s Tegula paving stones for the surface. 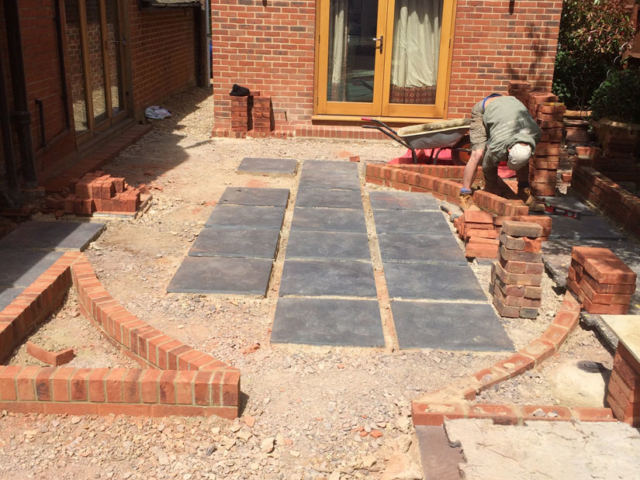 A soakaway system was also installed. 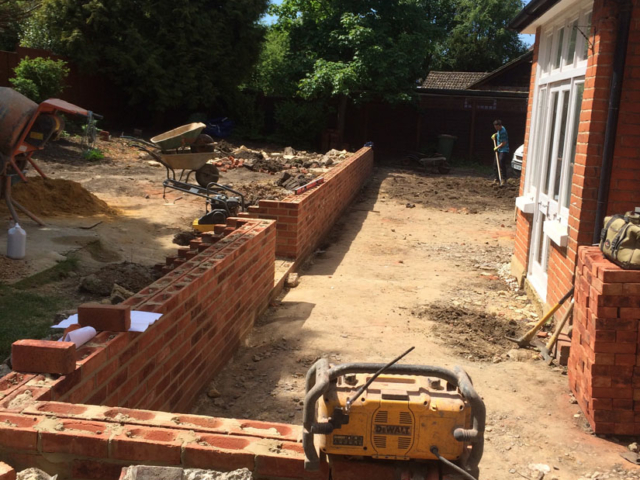 The dividing wall was 14m in length and over 2m high. 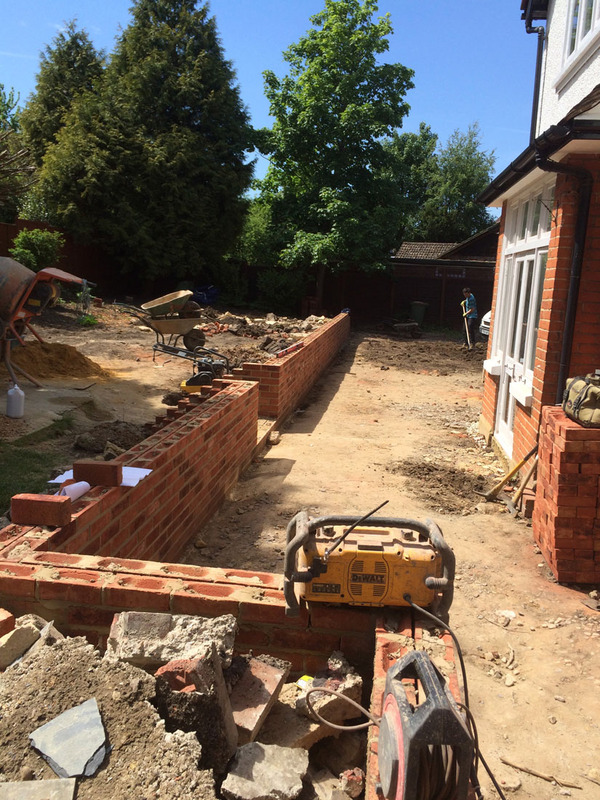 A real joy for our experienced bricklayers to get their teeth stuck into. 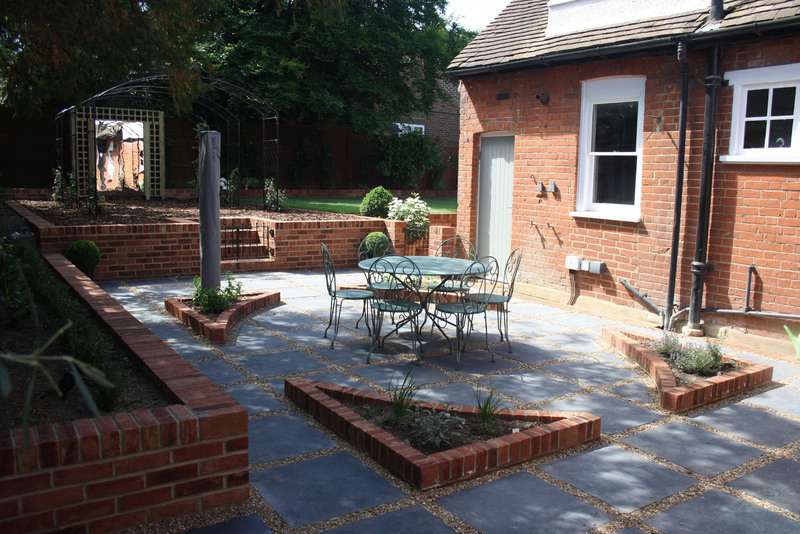 The bricks were the same as used in the back garden which also matched the house. The detailing was created with soldier course detail and the beautiful archway. Considering how big the wall was, the choice of materials used, and the detailing features ensured that the wall looked as though it had always been there. 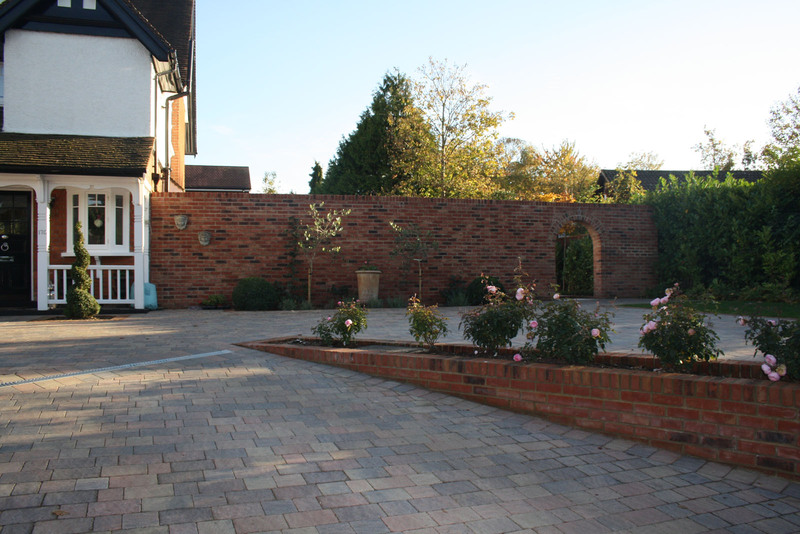 We also used matching bricks to border the driveway planting beds, which adds continuity around the 1000m2 gardens. 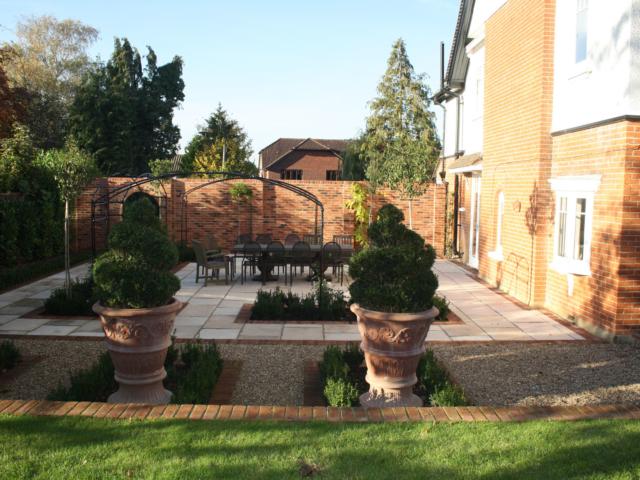 Lastly the planting and lawn laying in the front garden and once again, it added the colour and softness required for such a huge area of hard landscaping. This was a huge project and a real demonstration of our landscaping skills, working to millimetre precision, but also assisting with the selection of materials to ensure the project seamlessly matched the character of this period property. 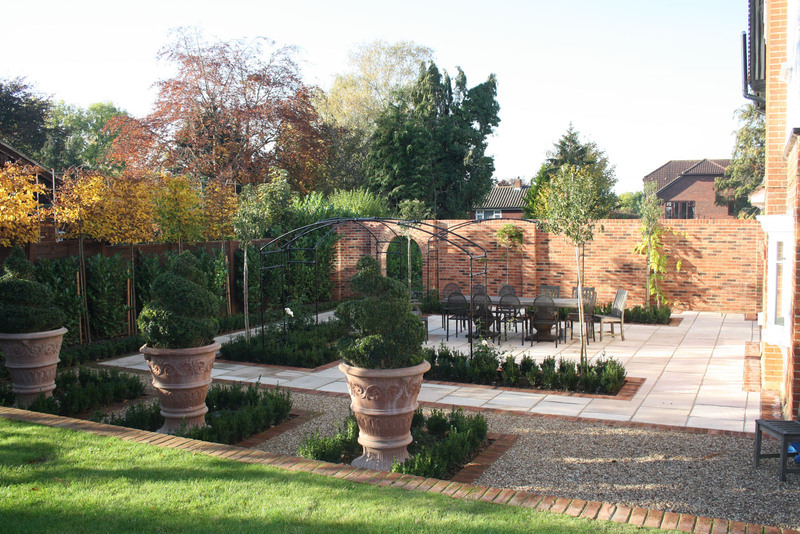 Our client was extremely satisfied with the project and now that the planting has matured, the gardens look even better!